I grew up along a rural road, in a rural county, in a state with some wide open spaces. There was no “my neighborhood,” it was more like, “my road.” Along that road children where peppered over ten miles – sparingly. So, in central Alabama it rarely snows, and when it does (trust me) it’s a big deal. But no one on “my road” had snow boots — why would they? Because when it did snow it was nothing more than an inch (at the most). 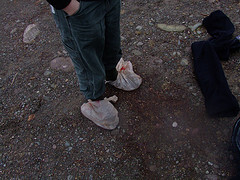 So we did what any frugal southerner would do when they wanted to play in the “snow.” We would tie plastic Piggly-Wiggly or Wal-Mart grocery sacks around our shoes, and off we would go. The smart kids would put the sack over their socks and then put them in their shoes, but that’s another issue. Often when these storms would come, it would happen quickly and the snow would be gone within a matter of hours. So if you wanted to experience snow in Dixie, you had to move quickly. This is often how life comes at you. Changes will occur, and you often feel ill equipped to handle it — why would you? Â You have rarely experienced “this” before! Rick Warren says in his book The Purpose Driven Life, “Growth is often painful and scary. There is no growth without change; there is change without fear or loss; and there is no loss without pain. Every change involves a loss of some kind: You must let go of old ways in order to experience the new. We fear these losses, even if our old ways were self-defeating, because like a worn out pair of shoes, they were at least comfortable and familiar.”  So jumping off of pastor Warren’s metaphor of growth and shoes here are some things to think about. Look down and see what kind of shoes are you wearing. If you happen to be in West Virginia, or live on my road in Alabama, look around you may not have seen any for a while, but they are in the house somewhere. Hobo Shoes — You Have to Change, it’s Just a Matter of When. In dealing with change and growth you may be (metaphorically) wearing different kinds of shoes. 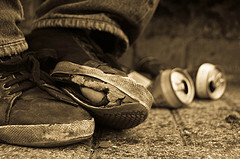 The first kind of shoes you may be wearing areÂ Hobo Shoes. These shoes feel great. They breath when you wear them, even though those around you can’t. Â These shoes are well broken in. You know how they will feel, even before you put them on — that’s because there isn’t much shoe to put on. These are the people who won’t change because what they currently have “works.” But let’s be honest, when people look at you, they are not going to trust you. “Why?” you ask. Because you look like a hobo. Â These are the people who say, “We’ve never done it just way before” or “If it was good enough for my daddy, and his daddy, and his daddy, and his daddy (you get the idea) then it’s good enough for me!” Why change — because the shoes you are wearing, have long since been worn out. If you wait too long to change you lose credibility. Track Shoes — As you Change, Constantly Evaluate. Another type of shoe you may be wearing are track shoes. Â These people love to move, run, jump, and do hurdles. They are focused on moving forward (as fast as they can). They are focused, and they seek to improve their time. People who (metaphorically) wear track shoes keep their eyes forward, but they are listening for the sounds of pounding pavement behind them. Â The problem with people who wear track shoes while engaging change is that they are so focused on moving forward faster than anyone else, is that they fail to realize that they are running in circles. Around and around they go, and never really going anywhere. it feels like things are being accomplished because there is movement. But in reality, the same issues keep popping up again, and again, and again. Track shoe people don’t like to stop and evaluate. If they stop, someone may get in front of them, and take their place. Â Their focus is the recognition, the prize, and the ribbons. Kid’s Shoes — Keep Changing, Don’t Stop. The last shoes are kid’s shoes. I have four kids and they are constantly going through shoes. It seems as soon as we buy a pair they have either “ragged them out” or outgrown them. So we are constantly changing shoes. This is the most healthy way of dealing with growth. 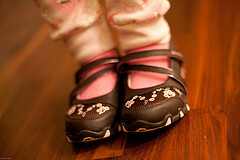 When you are feeling the pinch of crowded toes, or the shoes are disintegrating, then get a new pair.Change your shoes. You may get the wrong size, or they may not fit exactly right — that’s ok. Try them on in the store, give them time to stretch and break them in, and even exchange them if you need to. But never stop moving into new shoes. Mom, where are the Piggly Wiggy bags? I think it’s starting to snow! Rick Warren,Â The Purpose Driven Life (Grand Rapids, Michigan:Zondervan, 2002), 220. Sometimes when you are given new shoes you need time to stretch and break them in. It is discouraging to be expected to run a marathon in new shoes. Sometimes, people want change, they want the new shoes, but they need time to break them in. Sometimes that can be mistaken as people that “wonâ€™t change because what they currently have â€œworks.â€ If there is more talk about running in new shoes than there is encouragement while they are broken in – then you actually end up discouraged which can appear to be resisting the new shoes. Those are the times that encouragement from the sidelines means more to the person wearing the new shoes than seeing a coach on the track with a stop watch. …..that is why this is my favorite part of your article because that sounds more like love.